In collaboration with the National Center for Microscopy and Imaging Research (NCMIR) at the University of California San Diego, ZEISS releases a new Focal Charge Compensation module for block face imaging with ZEISS GeminiSEM and 3View® from Gatan, Inc. Focal Charge Compensation expands versatility and considerably increases data quality without prolonging acquisition times. It enables easy imaging of even the most charge prone samples. Resin embedded tissues and cells can now be imaged without charging artifacts, while the pixel dwell time is reduced. Decreasing beam exposure time ensures fast acquisition rates and guards against sample damage. This is key to acquire reliable and reproducible 3D data. 3View® from Gatan, Inc. elimnates specimen charging by using a gas injection system. It consists of a tiny capillary needle, which is precisely located above the sample. Nitrogen is guided through this needle directly onto the block face surface while the chamber is maintained under high vacuum. This eliminates charging without degrading image quality. The needle retracts automatically during the cutting cycle so the workflow is uninterrupted and high acquisition rates are maintained. 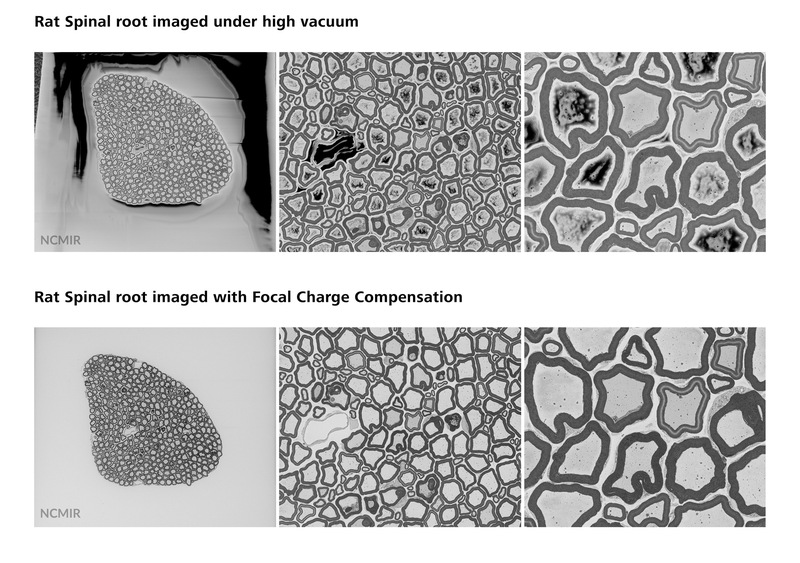 Charging effects are clearly visible under high vacuum, in contrast to images taken with Focal Charge Compensation, which show no charging effects even in large expanses of bare resin. The images show a ~300 micron diameter axon bundle at different magnifications. Images courtesy NCMIR. The 3View® system consists of an ultramicrotome, which is integrated directly into the vacuum chamber of the ZEISS Sigma and ZEISS GeminiSEM field emission scanning electron microscopes. It enables automated serial block face imaging of embedded samples (e.g. cells or tissue) with a slice thickness down to 15 nanometers. The sample is continuously cut and imaged, and a three-dimensional rendering of the sample with nanometer-scale resolution is then reconstructed.